Most people, even those (Americans) who don’t care about soccer, know that Spaniards are pretty damn good at kicking a ball around. The Spanish national team has won an unprecedented 3 international tournaments in a row, including the World Cup, which is kind of a big deal. In addition, pretty much everyone has at least heard of the two biggest club teams in Spain – Real Madrid and Barcelona – which are, respectively, the most valuable and third most valuable franchises in sports. Those clubs are, and have pretty much always been, pretty successful on the pitch too. And while the best players on those teams have tended to be foreigners (see the current superstars Messi and Ronaldo, or last generations’ talismans Zidane and Ronaldinho), the backbones of the squads have always featured a bevy of talented Spaniards. The biggest clubs in England, on the other hand, have over the years begun to feature fewer and fewer Englishmen. Take the English champions, the 2nd most valuable franchise in the world (the US has to content itself with the Yankees in 4th and Cowboys in 5th), Manchester United. For this week’s Champions’ League contest against Bayer Leverkusen, only 4 of the 11 starters were Englishmen. The other Champions’ League participants from England were even worse. Chelsea and Arsenal had 3 English starters while Manchester City only featured a single English player at the start of the match, and that was the goalie, Joe Hart. This is a worrying trend for the self-proclaimed “inventors” of soccer. 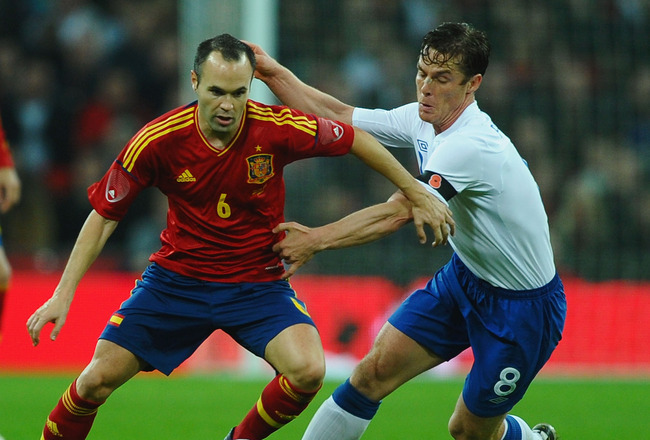 The English national team is miles behind the Spanish equivalent in terms of talent. And while the English did win a World Cup, that was 50 years ago, and on home soil, where they took advantage of some questionable refereeing decisions. The problem, quite simply, is that English players just aren’t that good (they’re better than Americans, but that’s not saying much, for the time being). Yes, some extraordinary talents do manage to emerge, the Gerrards, the Rooneys, the Gascoignes. But they are few and far between. The average English player is just plain worse than the average Spanish one. Why might that be the case? Experts will point to things like the differences in the youth academy structuring in the two countries or the lingering after-effects of the Heysel disaster or perhaps the greater financial resources of, and therefore pressure on, the average EPL team. But the real cause of this gulf in footballing talent has nothing to do with soccer and the business of soccer. The real reason why Spaniards are better than Englishmen at soccer is that Spain and England are in different timezones. First some background. Spain, despite lying almost entirely west of the UK, is actually one hour ahead of the British Isles. For those of you who are dyslexic and have no idea what that means, it means that when it is 7am in London, it is 8am in Madrid. Usually a place that is to the west of you will be in a timezone behind you. This makes sense. Chicago, for example, is west of New York, so when it is 7am in New York and the sun is rising, it is still 6am in Chicago where the sun has not yet risen. The situation in Spain and the UK is reversed. When the sun is rising at say 6:14am (these times correspond to late summer) in London, it is actually 7:14 in Madrid, where because it is west of London the sun has not yet risen. The sun will not rise until 7:45am in Madrid. Meanwhile when the sun is setting sometime around 7:40pm in London, it is 8:40pm in Madrid, and the sun will not set for another 15 minutes. Basically the timezones have made it so that the sun rises and sets extremely early in the UK while it rises and sets ridiculously late in Spain. What does this have to do with soccer? The simple answer is that this has to do with everything. While it may sound preposterous, this time zone difference is perhaps one of the prime drivers in the development of completely disparate cultures in Spain and England. Spain has become a culture that does everything later. Dinner regularly begins after 9 pm. One does not even start going out until midnight. People in England on the other hand might well be done with dinner and their first pint by 6pm. For aspiring soccer players, this makes all the difference in the world. An English kid will start playing soccer after school but his playing time will be curtailed by an early dinnertime, and then after dinner it will almost certainly already be dark. Meanwhile a Spanish kid can happily play uninterrupted after school until being called in for dinner when the sun is already beginning to set anyway. This might not seem like much, but an extra hour and a half a day — every day — adds up. The Spanish kid will be better technically than the English one. And this because of an illogical timezone difference. So who decides what time it is? Apparently any government can just decide arbitrarily. While time zones in international waters are orderly — every 15 degrees of longitude is a different timezone – sovereign nations decide how to split up their own timezones. India, for example, just decided to make its timezone half an hour off from everyone else’s. So when it’s 4pm in New York, it’s 1:30am in India. China just decided to make its entire country – all 60 degrees of longitude — one timezone. So what if the sun doesn’t rise in Western China until 10 am? It’s just easier this way. France used GMT (the same timezone as the UK) until WW2 when the Germans changed the timezone during the occupation to match their own timezone. The French didn’t change it back, because, hey, this way the sun would set later and they could all act a little more Spanish (While the French national team might be going through a rough patch of form, in general French players are also more technically gifted than their English counterparts). This drawing of time zones is sneakily one of the most important decisions countries make. How the lines are drawn can have a profound effect on the culture of a region. So England takes its early risers, and its early bedtime. Considering its unimpressive soccer team, why not just move ahead an hour? Well consider this: that extra hour and a half of play time the Spanish kid gets? It ends up being an extra hour and a half of daylight in the morning where the English kid can learn math or something. Just as the extra practice is good for the Spanish national team in the long run, the extra math practice is probably good for the English economy in the long run. After all England only has a 7.7% unemployment rate. Spain meanwhile is straddled with an almost unbelievable 26% unemployment rate. But, hey, if you want a good soccer team, you’ve got to make sacrifices somewhere. Cheeky wanker. I’d like to see you pull a dataset of historical squad composition; it’s important to your argument that this time-zone difference hasn’t manifested itself in 2011, but has been in place post-WWII (or whenever appropriate). And by “buy this,” of course I mean I’ll shameless disseminate this theory at any opportunity.